Had enough of zombie movies yet? No ? Really? Well you're in luck, then, as on 8th October Monster Pictures are to release a 2-DVD set titled Ultimate Zombie Feast boasting five hours of zombie films of varying length, including festival favourite Dead Hungry, the action-packed Arise, the gore-chic of Paris by Night of the Living Dead, the exclusive feature-length Mormon zombie movie The Book of Zombie, the animated It Came From the West, and one of India's first zombie movies Savages. 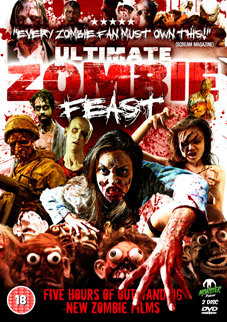 Ultimate Zombie Feast will be released on 2-disc DVD in the UK on 8th October 2012 by Monster Pictures at the RRP of £15.32. No extras have been listed, but there are a lot of films here, so who's complaining?